According to former Vice President Joe Biden, moral authority is the property that Virginia Gov. Ralph Northam forfeited when a photo from his 1984 medical school yearbook page came to light and he couldn't clearly say whether or not it depicted him in blackface or Klan costume -- though, he conceded, he once blackened his face for a Michael Jackson costume. Calls for his resignation resounded. Biden chipped in with gusto. Or maybe -- a trifle likelier -- the vitality of the Democrats' alliance with African-Americans required Northam's leperization, to which deed Biden applied himself by appealing to the moral norms as defined by ... well, Biden. I hazard a guess: Moral authority is anything that political expediency obliges politicians to say it is. This is because politicians mostly run our lives these days, having wrested, through the ballot box and sheer presumption, the power of defining right and wrong. 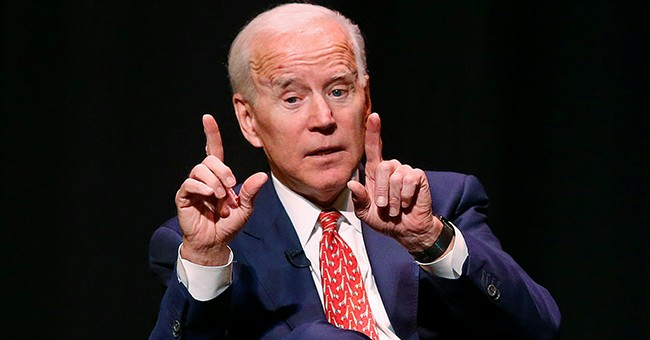 Biden, for example, -- once famous for plagiarizing the speeches of a British Labor Party leader -- has ruled Northam an embarrassment needing to be dumped on an outgoing load of political rubbish. Not a lot of nuance here, Joe, not a lot of charity -- least of all, having to do with how Northam thinks and acts today versus 35 years ago. But so we talk these days. To put it another way, we've become authorities on what's authoritative: on what to believe and what not to believe. We like and listen to the authorities we have picked out on account of the congruence of their views and our own. We choose Fox News over CNN, Kimmel over Rush -- such being our First Amendment right. We reduce moral understanding to the level of what I want, what I need. We readjust the ancient norms of the human race -- proceeding from natural law, religion and experience -- to options as distinguished from truths once generally seen as embodying ideas about human good and therefore worthy of propagation. The irony of Biden's moral rebuke of Northam isn't Biden's personally compromised record on moral authority. The true and abiding irony is the text Biden chose to take on Northam's unfitness for office. He criticized a 35-year-old photo. He ignored the governor's "tut-tut, never mind" about a bill in the Virginia Assembly that would loosen present safeguards against infanticide of a baby born alive during a late-term abortion. The governor, a pediatric neurologist by trade, scarcely blinked when interviewed about procedures already standard in such relatively rare cases. The "infant" -- he was clear, anyway, about that descriptive -- would be delivered and resuscitated "if that's what the mother and the family desired, and then a discussion would ensue between the physician and the mother." And maybe the kid would live. And maybe, again, he wouldn't be allowed to. We don't use the term "moral authority" here. We call it "moral relativism" -- maybe life, maybe death. Whatever. No hint of moral horror escaped the governor's lips, even as he recounted the facts. Moral horror we leave for other life situations, such as the prospect of alienating a key voting bloc and possibly, in consequence, losing an election and then -- horror of horrors -- losing political power.